Tudor Q and A: Question from tudorfanatic - Photos of Henry VIII's vault, parts of surviving palaces, etc. 1. Is there a sketch out there? Does anybody know where a copy is? I'd love to see it. I think the last time Henry's vault was opened was before photography was invented, so there wouldn't be a photo. I'd love to be wrong about that though. 4. I know Henry's writing desk is usually on display at the Victoria and Albert Museum. And a ring belonging to Elizabeth I was on display at the Elizabeth exhibit in Greenwich in 2003. I don't know where the ring is now though. Also the Tower of London has a suit of armour that Henry wore at the Field of the Cloth of Gold on permanent display in the White Tower. And, as there are so many Henry VIII exhibits on this year, there are undoubtedly other items belonging to him out there too. 5. Obviously nobody but a fortune teller can answer a question that starts out "Will there ever be a time that.." Anne's body as well as those of Katherine Howard and Jane Grey were exhumed, identified and given a new (and presumably "proper") burial during Queen Victoria's time. Stones were erected over the new graves in St. Peter's at that time. Do you think they should be moved somewhere else? 1) St George's Chapel is a Royal Peculiar, and as such the vault can be opened only with the explicit permission of the monarch. I believe Kathy is correct: The last time that permission was given was in the 19th century and no photographs were taken. Certainly in all the years I have been researching the Tudor era, I have never come across any photos of the interior of the vault. 2) A goodly portion of Hampton Court existed during Henry VIII's day. If you ever visit, you can tour the Tudor-era kitchens. The indoor tennis court existed in his day, as did the sections known as the Base Court and Clock Court. Much of the western half of the palace is Tudor-era in origin. Certain portions of St James's Palace also date to the Tudor period, but the palace itself is closed to tourists. 3) Depends on how you define "original form." Almost every palace, castle or house from the period has been modernized to some extent, with electricity and plumbing added. Others have been massively remodeled but made to look old (people in the 19th century loved to do that). There are a few that look very much as they did in the Tudor period, but none are truly in their "original" form. The Scottish castle Eilean Donan, used by BBC America in their logo and used as a location for the Hollywood film The Highlander, for example, appears to be ancient but was actually largely re-built in the 1920s on the site of an ancient ruin. 4) Kathy noted a few items that are sometimes on exhibition. There are quite a few others, most of them scattered among various palaces, castles, and houses. Hatfield House, for example, has a few items that supposedly belonged to Elizabeth I. Arundel Castle has Mary Stuart's rosary. 5) This question gets asked a lot on this website, and I always answer it the same way: Despite the claims made by the tour guides at the Tower, the bones of Anne Boleyn, Katherine Howard, and Jane Grey are NOT beneath the marker stone in the floor to the left of the altar. They are actually beneath the wall monument further to the left of the altar. The marker stone even says "near this spot...."
In order to "dig them up," the entire wall would have to be taken down. Further, while the body of Anne Boleyn was tentatively identified, those of Howard and Grey were not. Even the identification of Anne's body is highly suspect given the rudimentary state of forensic science in the 19th century. As an example, bones identified in the 19th century as those of the Princes in the Tower were revealed in the 20th century to be primate bones, probably from a monkey once kept in the Tower menagerie. I would never trust the identification of bones made in the 19th century ... or even the early 20th century. You have posed quite a few questions here. You will be happy to know that there are answers to most of your questions in previous discussions and areas on this site. You can use the search box to look for them. Both these sites have information posted on Henry VIII. I'm not sure if a firm count of houses built during the early 1500's has ever been done but there are many, many, many still standing although most with some alterations. This would include ordinary residences, not just royal palaces. Thanks, tudorfanatic. I had read a description of the vault at St. George's but didn't know there was a sketch available. Hampton Court has Henry's Rosary beads (they're huge!) as part of the Henry's Women display, and an item belonging or connected to each of the 6 wives (so Katheryn Parr's lock of hair etc). Just further to PHD's comments, the tennis court at HCP is not Tudor. It's based on the original site and design but is infact Stuart ( I think to be exact it's Charles II but I could be wrong), and also you can still see the original Tudor gatehouse at St James', just not the rest as it's still a royal residence, as you rightly said. I'm a bit confused by a couple of things here. 1. Regarding the bodies of Anne Boleyn et al. at the Tower: PhD Historian, was a wall constructed over the bodies when they were reinterred during Queen Victoria's time? If not, I would think it would be easy to exhume them again without tearing down the wall if permission were granted to do so. Though it's highly unlikely to happen under Elizabeth II. 2. Regarding the vault at St. George's Chapel, I'm having a bit of a disconnect over the two sketches. The one of Henry's coffin looks like it's in a relatively small, confined space, but the other sketch makes the vault area look enormous. Obviously I'm not interpreting this correctly. Can somebody explain? tudorfanatic, you might want to take a look at What's Left of Henry VIII by Deborah Jaffe. It's basically a very high-level guide book with lots of very good pictures. It covers pretty much every existing location that was associated with Henry VIII. The lovely locket ring with the images of Elizabeth and Anne Boleyn that was in the 2003 Greenwich exhibition belongs to the Chequers Trust (Chequers is the Prime Minister's country residence) and is loaned out for exhibitions from time to time. I'm with Joanna on the exhumation question. Let them rest in peace. Kathy, during my own research on Lady Jane Grey, I met with a curator of the Tower in the summer of 2005. We toured the Chapel of St Peter with the head yeoman warder. The information that I was given at that time by the curator was that the Chapel was refurbished during the Victorian era, and that part of that refurbishment involved restoration (rebuilding) of some of the ancient walls and monuments in need of repair. One of those walls was the wall to the left of the altar, which has a large funerary monument built into it. As I understand it, portions of the chapel, including that wall and monument, were dismantled during the restoration in order to re-build them in stronger shape. During all the dismantling, the bones were discovered beneath the floor. After being examined, they were all placed in a single container and re-buried ... before the restoration of the building's structure was completed. Largely by chance, the re-built wall and monument ended up over the re-buried bones. In any event, the important point of all this is that the bones are not directly beneath the marker set in the floor. As the marker says, they are near that spot, but not on that spot. I too am a bit confused by the difference in the two drawings. Vaults, sometimes called "crypts," beneath churches are often quite large ... much larger than one might expect. The drawing of the massive vault supposedly beneath St George's seem to me out of scale in comparison to the chapel itself, however. I always assumed that Henry VIII's (and Charles I's, not II) burial vault was fairly small, much more like the space in the other drawing. Perhaps the drawing that I found is mislabeled? Or a product of or exaggeration from the active Victorian imagination? Joanna, thanks for the correction on the "Tudor" tennis court at Hampton Court. It's been 2 decades since I was there last, so my memory is faulty. And I am with you on throwing things over the question of digging people up to re-bury them! TudorFanatic, I understand your frustration over Tudor-era palaces and castles being remodeled, but do remember that virtually all of them were privately owned prior to the 20th century, and many of them are still privately owned. The owners still actually live in many of them. The owner of Belvoir Castle, the Duke of Rutland, just had a huge dinner party there to celebrate his own 50th birthday. Imagine trying to live in a house and have parties in it if it were still exactly as it was when it was built in the 1500s! No electricity, no bathrooms, no heat, no furniture less than 400 years old ... it would be unlivable! Since all of the surviving castles and houses were active residences where people lived and worked everyday, they were remodeled periodically to keep them livable. Just be grateful that they were simply remodeled rather than being torn down completely and replaced with a new structure the way so many others were. Henry VIII, Jane Seymour, King Charles I and a child of Queen Anne are buried under a slab in the quire. The Royal Vault is something completely different and dates from the early nineteenth century - about 1812, if my memory serves me correctly. PhD Historian, thank you, that clears up some of the problem at least with respect to St. Peter's. Since I'm going to Windsor anyway, I will print out the two pictures and see if I can get any answers from anybody on the spot as regards the differences. I understand waht your saying phd historian, But remodeled tudor palaces and castles may aswell not exist because its not origanal is it,So people who are passionate about the tudor era like my myself dont really want to see these remodeled palaces ect we want to see origanalty. And also when they were remodeled to how they were they have infact over exaggerated on how they origanaly looked like for example the entrance at hampton court (the towers) are a lot bigger than the origanal.. So personaly i find it difficult to appreciate it as much as what i would of done if was origanal from the the tudor era.. The various "royal vaults" at St George's Chapel are confusing. So I did a little quick research. According to Charles Knight's Guide to Windsor of 1811, "Near the first haut pas of the choir, is the Royal Vault, in which are deposited the remains of Henry VIII and his Queen, Jane Seymour, King Charles I, and a daughter of Queen Anne." The Chapel's official website describes the building of a "new" Royal Vault between 1804 and 1810 to house the remains of many of George III's relatives. That "Royal Vault" is beneath the former Lady Chapel, later known as the "Tomb House" but now known as the Albert Memorial Chapel. And then there is the "royal vault" beneath the George VI Memorial Chapel just off the north wall of the choir/quire. It now holds the remains of King George VI, his wife Queen Elizabeth (later the Queen Mother), and Princess Margaret. But apparently the only space that "officially" qualifies to be called the "Royal Vault" is the large area beneath the Albert Memorial Chapel. And presumbaly that is the space depicted in the engraving that I had sent to Lara. I understand your frustration, TudorFanatic, and it is indeed true that the Victorians in particular had a penchant for "restoring" things in a way that grossly exaggerated the original features. But it is a harsh reality of the human experience that nothing remains the same. I doubt that you could find even one entirely original human-constructed building that survived unchanged for more than about 25 years. Short of sealing it up in a bubble and not allowing anyone near it, anything made by humans is going to change or be changed as the years pass. Without repair and remodel, it will rot, fall apart, and completely cease to exist. PhD Historian, are their other vaults there as well? I'm thinking specifically here of Charles Brandon who is buried somewhere below the South Choir Aisle. I have found a contemporary description of his burial, but later accounts say he was interred in a vault next to the vault where Henry intended to be buried himself (and ultimately was). That would seem to argue for other vaults there, but certainly nothing on the scale of the drawing.. There are indeed other burials in the choir/quire area of the Chapel, Kathy, as well as in the nave. But I guess whether or not we should call those spaces "vaults" depends on how one defines the term. I tend to think of a funerary "vault" as holding more than one coffin. Single burials are simply a "grave." Charles Brandon was buried "near the south door of the choir," and the grave is apparently now marked by a very simple black marble stone. But does one grave constitute a "vault"? The "Gloucester Vault" holds the remains of George III's younger brother, Prince William of Gloucester, his wife, their only son and one daughter, plus a granddaughter. I have not been able to find a reference to its precise location within the Chapel. Henry VI is reportedly buried beneath the South Choir/Quire Aisle (there is some dispute whether or not he was later moved), but alone. Edward VII and Queen Alexandra are buried nearby in the same aisle, presumably in a small vault (though there is an above-floor monument as well). Edward IV and Elizabeth Woodville are buried beneath the North Choir/Quire Aisle, probably also in a small vault. And George V and Queen Mary lie in the north aisle of the Nave, either in or beneath a large tomb monument. And there are numerous other vaults holding the remains of various deans and canons of the Chapel together with their wives, as well as other eminent figures of the British past, most of them beneath the floors of the many small side chapels built along the exterior walls of the main Chapel. The dimensions of Henry VIII's vault are 3 meters long by 2.25 meters wide and 1.5 meters high according to "The Royal Tombs of Great Britain" by Aidan Dodson. This book also has drawings of the tomb of Henry VII from 1869; the coffin plate and altar of Edward VI and a fragment of the wooden coffin of Elizabeth I showing her initials, date of death and a Tudor rose. Just adding to this (by the way, really interesting conversation! I like it! ), we can all lament as much as we like about how things have changed over the years but history didn't stop happening 500 years ago. It went on and goes on with every person and life that made these palaces so is the first place. This country has seen several civil wars, world wars, public disorder etc etc over the years so we are astonishingly lucky to have anything left. A lot of damage was done to many historical homes in the wake of Reformation, the Civil War and bomb damage, as well as personal tastes. The reason that the royal vault sketch shows a much bigger tomb than the vault containing Henry VIII's remains is that these are two different burial sites at Windsor. There are also monarchs buried near the alter, etc. 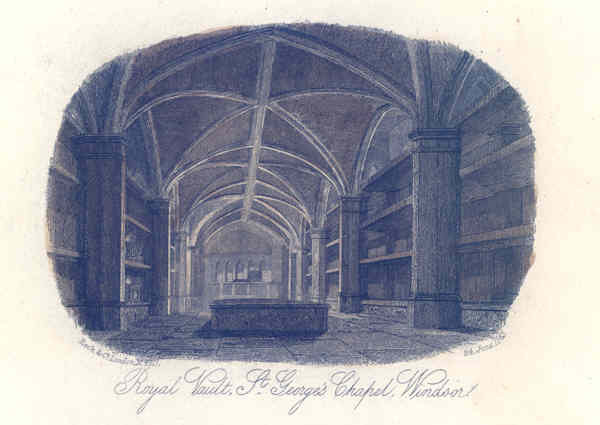 This sketch shows the vault in St George's Chapel where Henry VIII lies buried with Jane Seymour. It was made by Alfred Nutt, Surveyor to the Dean and Canons. Henry's coffin can be seen in the centre, with Jane to the right. Charles I, who had been swiftly buried here following his execution in 1649, is to the left together with a child of Queen Anne. The vault had previously been opened in 1813 when an investigation was made to determine the location of Charles I's coffin. A number of relics which had been removed at that time were returned to their rightful resting place in 1888, under the supervision of the Prince of Wales (later King Edward VII). Nutt recorded that Henry's coffin, which was approximately two metres in length, was in a state of disrepair and that some remains of the king were partially visible. It is likely that some damage had occurred during the hasty burial of Charles I. The location of the vault can be seen today, marked by a flagstone in the floor of the Quire of St George's Chapel. I believe the royal vault containing george iii and his relatives consists of stone shelves supporting purple velvet lead lined coffins for senior royalty and red velvet lead lined coffins for lesser royalty.the shelves are sealed by iron grating.in the middle of the vault is a platform for coffins and at the far end an altar. From what i know,the royal vault that contains george iii and his relatives is not as large as depicted in some pictures.The entrance to the vault is through an iron grilled door.The passage out of the vault leads to the mechanism which lowers coffins from the chapel above.There are also stairs leading down to the vault from a screened entrance behind the altar above.Although i have never seen the vault as permission is very rarely granted,i believe my description is pretty accurate. What a fantastic site which I discovered accidently. It is wonderful to know that there are some people as interested in the Tudors as I am and certainly more knowledgeable than I am. I have visted some of the places mentioned and am looking forward to seeing them again. PS: I named my daughter after Katherine Synford (mistress and later wife of John of Gaunt) and Katherine Parr. don't know if this blog is still active, nor if this is of interest considering tudor history is the topic; but, as to wondering about a photo of the royal vault, this seems to be an actual 19th century photo. happened across it. whether legitimate or not i don't know. can only discern--on the left--prince edward top & princess charlotte below.